View other bears from Steiff Cosy Plush Teddy Bears (Age 0+). 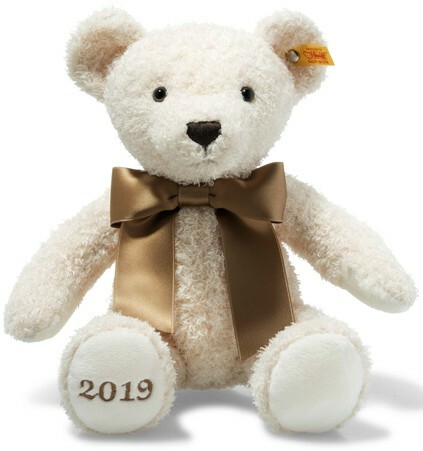 The Steiff Cosy Year Bear for 2019 makes a lovely gift to commemorate a special birthday, occasion or event in 2019. He has a soft cuddly coat of cream plush fur, safety eyes, a stitched nose and has the year 2019 embroidered on his right paw. He proudly wears a fetching brown satin bow, which is permanently fastened to him and he will win the heart of his new owner in no time, reminding them of their happy occasion in 2019. This is part of the Steiff Cosy range, which are all made from high quality soft plush fabrics and are safe from birth, so suitable for babies, children and people of all ages. Suitable for all ages, is machine washable and comes with the famous Steiff "Button in the ear" and classic yellow ribbon tag. This toy conforms with the current EC toy safety directive and carries the CE Mark.